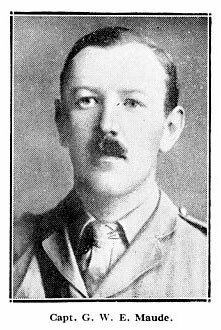 Born at Rylstone, Co. York, 20th November, 1888, elder son Lieut.-Col, William Wade Maude, 4th West Yorkshire Militia, of Skipton-in-Craven. Served in India with 1st Battn. during the Great War. Wounded in action at Dakka, Afghanistan, 17th May, 1919. Died at Peshawar of pneumonia, 5th November, 1919. Commemorated on Face 1, DELHI MEMORIAL (INDIA GATE). The photo on the left, and the brief obituary (below) from an unknown source, have been provided by Richard Roberts (<richard.nsw@googlemail.com>).